The following content is adapted from our semi-annual email newsletter. A test data viewer is also embedded below. Contact us to be added to our distribution list. What did analysis of millions of data points and interviews with tens of thousands of area residents have to say about Connecticut? This report is the first comprehensive community indicators program for Fairfield County, covering individual towns and neighborhoods. DataHaven produced the 82-page report in partnership with Fairfield County's Community Foundation, with support from major hospitals and government agencies. Information in the report, including data contributed from all hospitals as part of their Community Health Needs Assessment, is published at a local level for the first time ever. The Greater New Haven Community Index 2016 is a complete update of our popular, nationally-recognized 2013 report. The 2016 Community Index contains over 50 new infographics, maps, and tables related to well-being and key economic and social trends that impact the Greater New Haven area. 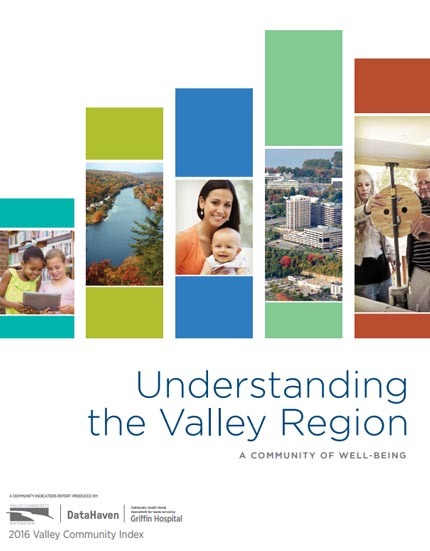 This new 58-page report was created in partnership with the Valley Community Foundation, Griffin Hospital, and an advisory committee of dozens of organizations based in the Lower Naugatuck Valley. It will be distributed to thousands of residents of Ansonia, Beacon Falls, Derby, Naugatuck, Oxford, Seymour, and Shelton. Two years in the making, the report relies on data from federal, state, and local agencies, as well as information collected directly from more than 16,000 randomly-selected statewide residents, including 1,050 Valley residents, as part of the 2015 DataHaven Community Wellbeing Survey. In the process of working with over 100 partner organizations since last year, we have created new statewide data resources that are not available from any other source. Some of these new datasets are mapped in our new reports. To further the purposes of those reports, we have developed an interactive online viewer so people can access even more maps and tables. Visit the front page of our website, or our Twitter and Facebook pages, to see many other recent articles, and to follow along as we release new information! Note: This feature is in development. In isolated cases, we have experienced delays in the page loading process. You can also try viewing it on Github: https://ct-data-haven.github.io/chime-v2/. Please contact us with any comments or suggestions.